CBSJoe Scarborough appeared on ‘The Late Show’ on Thursday night, along with Mika Brzezinski, his ‘Morning Joe’ cohost and fiancée. Joe Scarborough appeared on “The Late Show with Stephen Colbert” on Thursday night. The MSNBC “Morning Joe” host said he didn’t think President Donald Trump would run for reelection in 2020. Joe Scarborough thinks President Donald Trump will be moving out of the White House come January 2021 – of his own choice. In an interview on “The Late Show with Stephen Colbert” on Thursday night, the MSNBC “Morning Joe” cohost was asked whether he thought any Republican would challenge Trump for the party’s nomination in the 2020 presidential election. “I’ll tell you why I don’t want that it to happen,” Colbert continued. “I think it’s important that the voters of American have an opportunity to say, ‘Oops, my bad, we made a mistake there’ and correct themselves, and if Donald Trump doesn’t run, he takes away that corrective action of history and therefore his presidency is whole and unjudged if he just doesn’t run again. “He says, ‘I fixed it, made it great again, goodbye,’ and takes the $US100 million he’s raised and goes and, you know, makes another failing casino or something,” Colbert said. “See, that’s the thing: He won’t do that now,” he said. “He’ll get money from the Saudis. He’s right now proving to the Saudis that he’ll be their lapdog. He’ll make money from Putin after he gets out; that’s why he’s been Putin’s lapdog. Scarborough’s opinion on whether Trump will run for reelection is noteworthy, since the two used to be quite close. When he announced his candidacy in 2015, Trump was a frequent guest on Scarborough’s show. But over the course of the campaign, Scarborough and Mika Brzezinski, his cohost, became more critical of Trump, and in turn became the targets of some of his nastiest tweets. 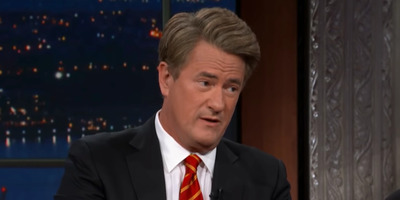 In an August 2016 op-ed article for The Washington Post, Scarborough called for the Republican Party to dump Trump as its candidate, and he later questioned Trump’s mental fitness for office. And in another “Late Show” appearance in July 2017, Scarborough said he planned to leave the Republican Party to become an independent.